Around 58,000 women and men are diagnosed with breast cancer each year in the UK and out of this 11,500 dying from this disease. With the rate of breast cancer increasing by 3.5% a year it’s never been more important to find a way of reducing these statistics. This study on Gabra3 suppression looks into identifying the processes in which metastasis occurs and ways to reduce it. GABAa is an inhibitory neurotransmitter in the brain that acts as a channel in response chemicals binding. This study focused on GABAa receptor alpha 3 or Gabara3 normally found in the brain however has been found in metastatic breast cancer. This receptor is thought to kick start the AKT pathway. It’s this pathway that stimulates cell migration and therefore metastasis. Metastasis is a secondary tumour away from the initial site, and is the cause of most breast cancer fatalities. Which is why finding a way to reduce metastasis is important as this will reduce the ever increasing death toll. Studying GABRA3 is vital as it’s only found in metastatic cancer tissues and as it’s a cell surface molecule has the potential to be a biochemical target. Currently being used to treat hypersomnia and therefore has the FDA approval making it more economically viable. Cells expressing Gabra3 found in the MCF-7 cell line showed an increase in cell migration. To measure this MCF-7 cells were tagged with a biochemical marker and inserted into mice mammary fat pads. Figure 1, Shows the primary tumour and lung metastasis in mice shown using a Xenogen bioluminescence technique. 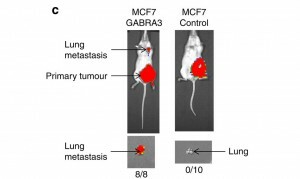 Mice that had the MCF-7 GABRA3 gene all developed lung metastasis as a result whereas the control mice showed no metastasis. 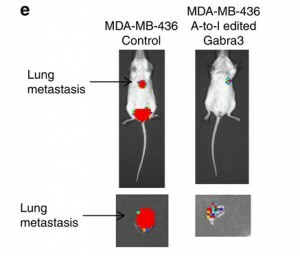 This confirms that Gabra3 is having a significant effect and results in metastasis. By altering the MDA-MB-436 breast cancer cells that express Gabra3 with the addition shRNA, which is a short RNS sequence that has a kink in it. This is used to silence target genes, this edited MDA-MB-436 Gabra3 shRNA should suppress Gabra3 and top the AKT pathway. This edited gene was tested using mice again as the MDA-MB-436 that expressed the edited MDA-MB-436 shRNA and a control shRNA was inserted into the mammary fat pads. 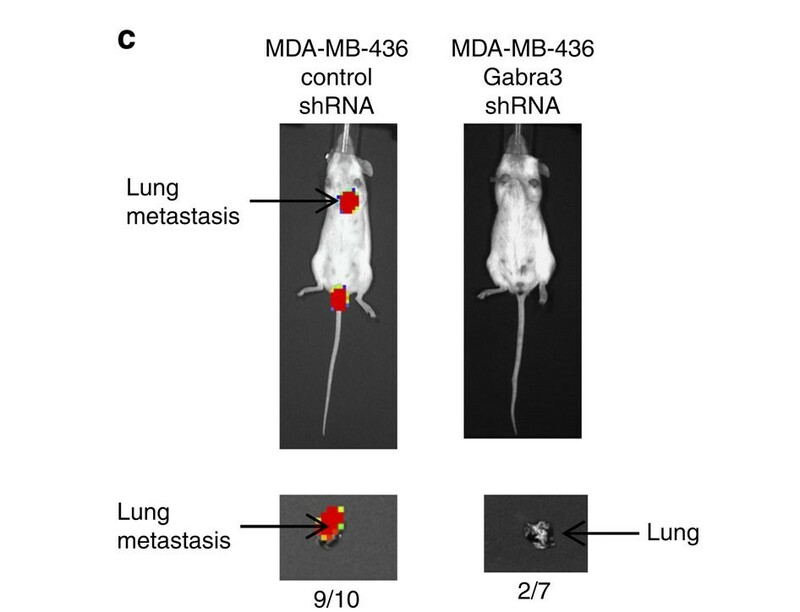 Figure 2, Shows the lung metastasis in the edited MDA-MB-436 shRNA and the control, shown using a Xenogen bioluminescence technique. The results of this experiment show that 90% of the mice with the control shRNA developed lung metastasis. 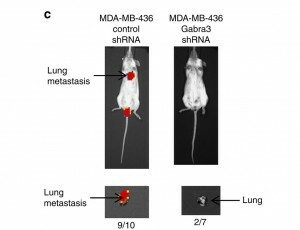 Whereas the mice with the shRNA edition only 29% developed lung metastasis. 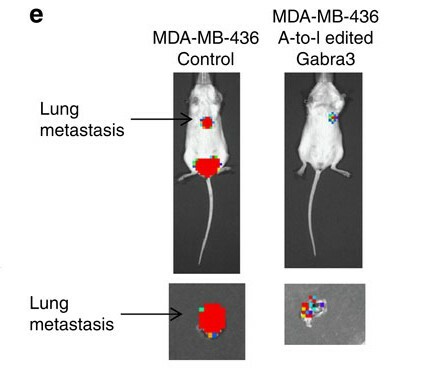 This shows that the edited MDA-MB-436 cells reduces the expression of Gabra3 reducing metastasis and increases survivability. Exactly how the shRNA edition suppresses the effects of Gabra3 is unknown and requires further experimentation. But the body created has its own edition of Gabra3 that stops the AKT pathway activation. At the I/M site in the brain the Gabra3 undergoes A-to-I RNA Gabar3 edition. Unfortunately this edition only occurs in non-invasive (or primary) breast cancers and not in the metastatic cancer, however understanding how this edition occurs could be used to produce a potential drug. By examining the differences between the non-invasive and metastatic breast cancer cells it was found that two specific enzymes operate this edition. These are ADAR1 and ADAR2 but its ADAR1 that is most significant. ADAR1 generates the ADAR1p110 enzyme, this enzyme was found in the breast cancer cells along with the normal human epithelial cell line (HMEL). Whereas the other ADAR1 enzyme ADAR1p150 and ADAR2 were not found in the cell lines. This indicates that it’s the ADAR1p110 enzyme that causes the A-to-I Gabra3 edition. To understand the effect of the A-to-I Gabra3 edition RNA edited Gabra3 with an A-to-G mutation was inserted to the I/M site in MDA-MB-436 cells in vitro expressing the unedited Gabra3. Cell migration and therefore metastasis was considerably reduced. Leading from this the A-to-I edited Gabra3 was tested in vivo to see if it had similar affects as the in vitro experiment. Tagged MDA-MB-436 cells expressing the A-to-I edition plus a control were injected into mice. Figure 3, A-to-I edited Gabra3 and control injected into mice, shown using a Xenogen bioluminescence technique. 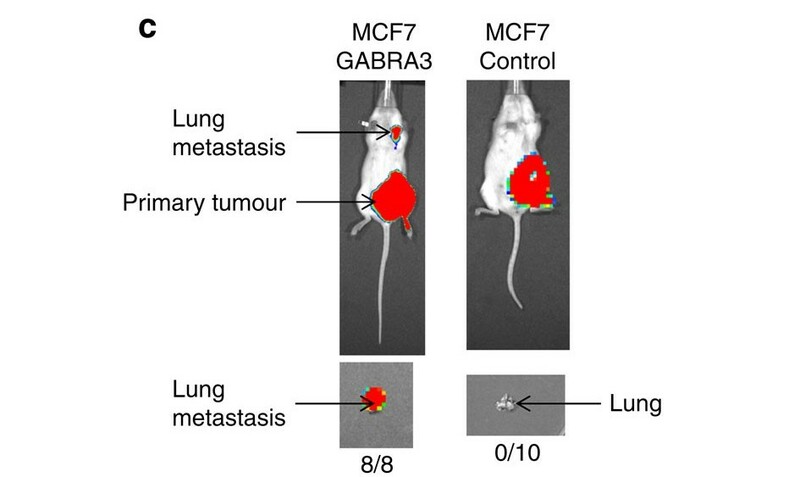 From this you can see that the control shows a high aggregation on metastatic cells, compared to the edited Gabra3 which shows a considerable difference in metastasis proving that the A-to-I edited Gabra3 has a positive effect in reducing metastasis. The edited edition of Gabra3 works because the unedited Gabra3 is a cell surface molecule and the A-to-I edited Gabra3 decreases the expression of the Gabra3 therefore reduces the activation of the AKT pathway so cell migration reduced. Edited and unedited Gabra3 were in vivo tested in MDA-MB-436 cell line to look at the interaction between the two Gabra3 molecules. They were added in an equal 1:1 ratio, the results of this show that the edited Gabra3 has the ability to suppress AKT pathway activation as a result of the unedited Gabra3 by 50%. How Gabra3 causes metastasis is unknown, it’s been proven to activate the AKT pathway causing series of chain reactions that leads to cell migration. Stem cells are believed to contribute extensively to metastasis, Gabra3 increases this stem cell production. By observing the stem cell population with the addition of the edited Gabra3 it showed that the edited Gabra3 actually has no effect on stem cell populations. This also confirms that it is the unedited Gabra3 causing a substantial increase in stem cell population. Patient fatality due to breast cancer is either therapy resistance or the development of metastasis. That’s why this study is so important with options to either target Gabra3 specifically using shRNA or increasing the A-to-I edited Gabra3 production. As Gabra3 is already a tried and tested molecule it already has FDA approval increasing its viability. In addition with this new evidence showing that Gabra3 has a significant importance and effect on cell migration and metastatic development further testing and experimentation on Gabra3 holds the solution to reducing patient fatalities caused by breast cancer.